Solar Energy In Oil Drilling: Beat Them, Join Them? Solar energy has garnered quite a buzz lately as China is said to beef up its solar installation this year. Fundamentally, many energy forecast scenarios by numerous agencies suggest while renewable energy would enjoy a higher growth rate, fossil fuels would remain as a dominant global energy source. Nevertheless, as the old saying goes — If you can’t beat them, join them. This seems to be what’s happening with at least one solar company. CNBC reported that GlassPoint Solar landed a $53 million investment from Royal Dutch Shell and the sovereign investment fund of Oman for its enhanced oil recovery (EOR) technology. As the company’s name suggests, GlassPoint’s technology runs on solar power, which produces steam to help pump more fossil fuel from conventional crude oil plays. According to CNBC, GlassPoint has been using this technique in Oman since 2012, and it helped the firm score more than double its initial funding. According to EIA data, Oman is the largest oil and natural gas producer in the Middle East that is not a member of OPEC, and that EOR techniques have helped Oman’s oil production rebound from a multi-year decline in the early 2000s. 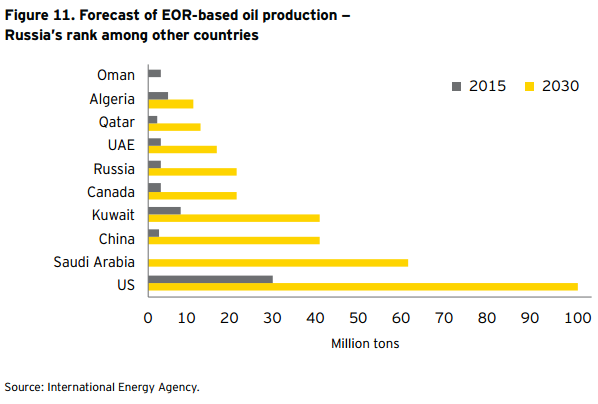 Oman relies heavily on complex EOR process to extract more oil than traditional drilling—to boost production. EOR is nothing new to the oil industry. With much of the world’s ‘easy oil’ already recovered, more and more producers are turning to EOR for prospects of ultimately 30-60% more of the reservoir’s original oil. CNBC quoted consulting firm Ernst and Young which estimated [oil] companies spend at least $5 billion annually on the [EOR] process, and the need for this type of methods to expand the efficiency of wells is particularly acute in places like Oman and Russia where oil fields are getting long in the tooth (see chart below also from CNBC). According to CNBC, GlassPoint’s CEO Rod MacGregor noted in an interview that “This application looks like the next step for solar.” Take it at face value, this new niche solar technology indeed looks very promising as it could reduce oil projects environmental impact, replacing and conserving other energy source used in the EOR process. This could become a tremendous growth area for the solar industry, and for companies with the expertise. But before everyone gets overly excited, keep in mind that ultimately, like any new technologies and methods, it will need to pass the number crunching test. The CNBC article made no mention of the cost factor. EOR is already a very cost-intensive process. So given that (1) The economics of solar and other renewable energy is still a much debated issue among experts, and (2) the intermittent nature of solar, I think the most likely scenario is that the new solar drilling technology would be become part of, but not replace the existing traditional methods. This would put a very different perspective on its growth prospect. Before the jury is in, solar industry should have no problem getting funding from oil companies that are desperate to gain some kind of positive association with any renewable drilling project. Whether this niche technology sector within the solar industry could lose support from the environmental cause due to the involvement with oil drilling is yet to be seen as well.